Read that, then come back when you're finished. I'll wait. Indeed, it was cruel of me to end on such a delightfully complicated note, but rather than dwell on the past, let's look toward the future, shall we? Excellent. So, just what is this vision before us? 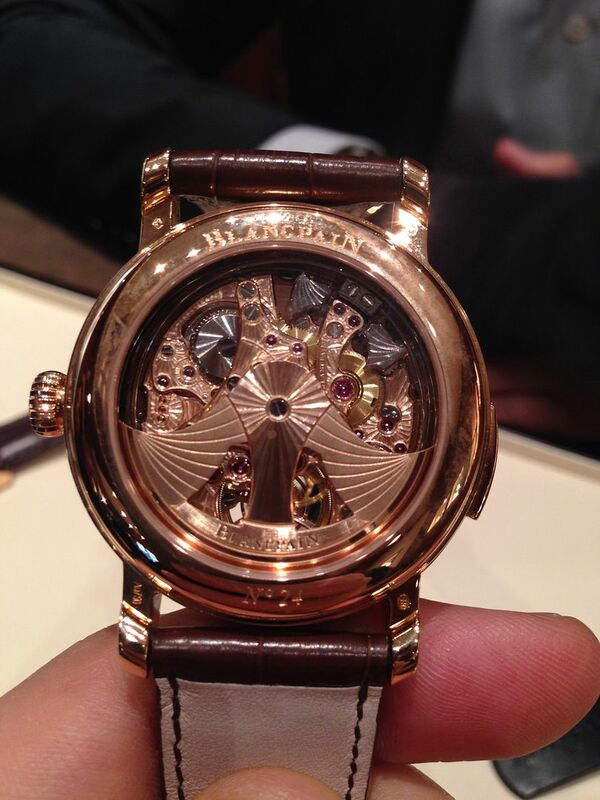 It's nothing other than Blancpain's Villeret Equation du Temps Marchante in red gold. The c. 3863 movement powers not only the equation of time complication, but also the perpetual calendar and moonphase indicator. All these functions are read off of a grand feu enamel dial, and the hand-decorated movement can be viewed through a demi-hunter caseback. If you want one, you'll be part of a select group, as only 188 will be made in red gold, with another 88 available in platinum. As with the other pieces in this family, all of the correctors are located under the lugs, and can be operated with your fingernail, so say goodbye to unsightly recessed pushers dotting the sides of the case. Hello, New York City! 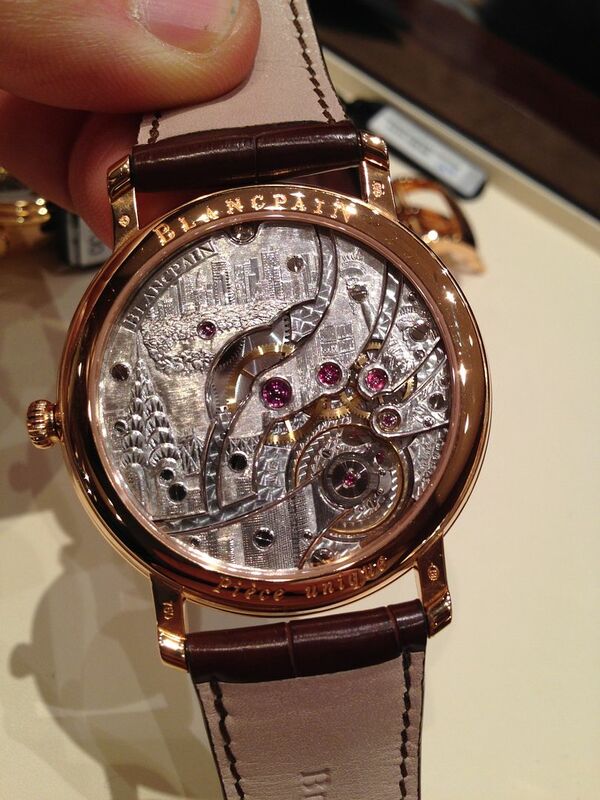 That's right, what you're looking at is an entirely hand-engraved montage of my fair city, as interpreted through the bridges of Blancpain's calibre 15B manual-wind movement. Yes, it's a piece unique, and yes, it's entirely awesome. New York City isn't the only metropolis that is honored with a Villeret Grand Decoration, however; these have been made for a number of cities, and they're only available through the local boutique. Ouch... 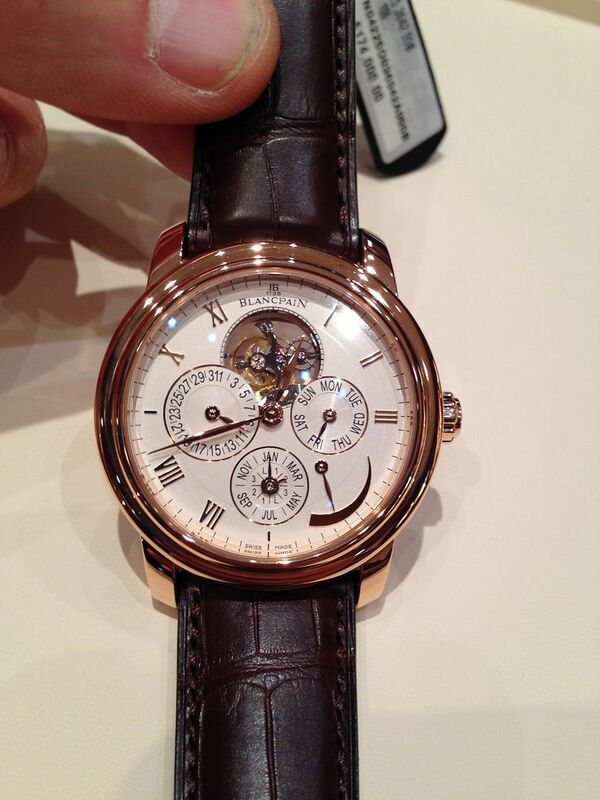 The Carrousel Repetition Minutes is a very serious watch. How serious? 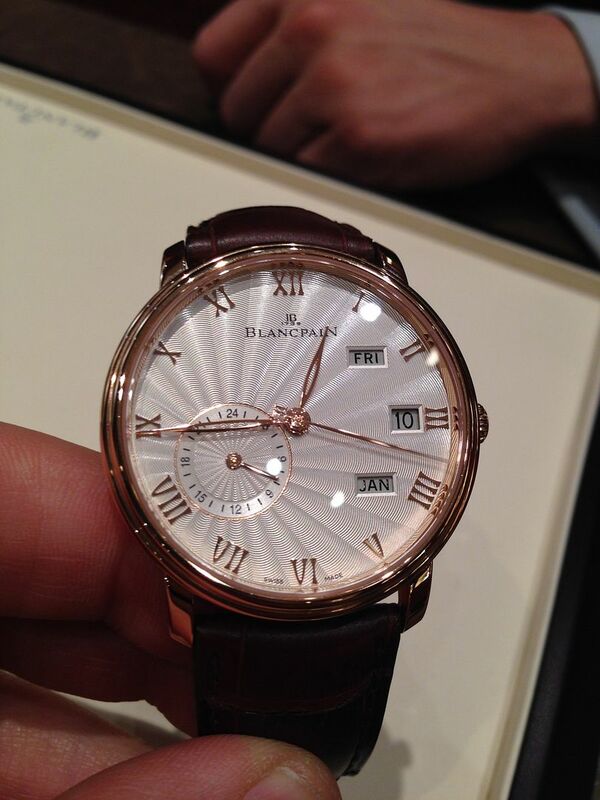 Serious enough to be part of Blancpain's Le Brassus collection and serious enough to be a cathedral gong minute repeater and serious enough to feature Blancpain's ingenious one-minute flying carrousel escapement and serious enough to have a grand feu enamel dial and serious enough to be crafted from 18-carat red gold. 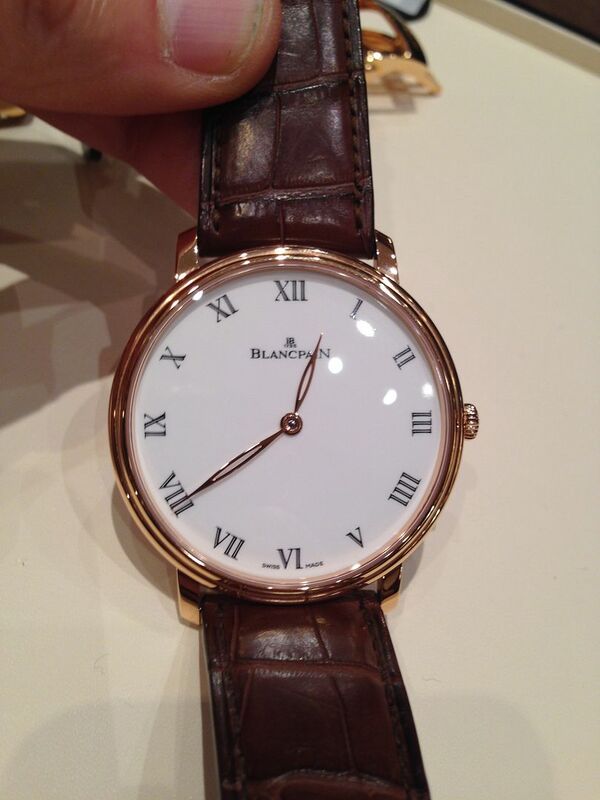 I want one, but the last time I checked, Blancpain wasn't accepting children as payment. Even the display back is serious. Like, really serious. 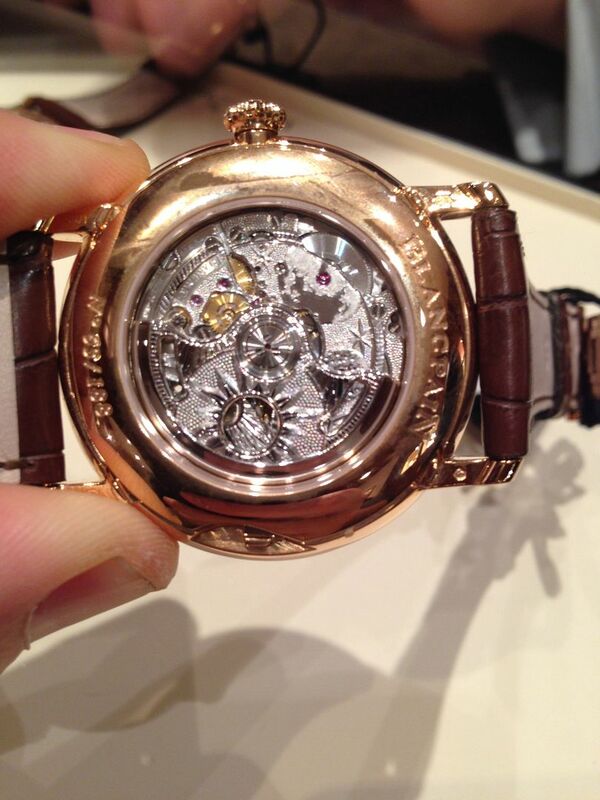 Here we have the Le Brassus Tourbillon Quantieme Perpetuel 8 Jours, which, again, is a very serious watch. As the name would imply, the calibre 5625A movement features a tourbillon with an 8 day power reserve and a perpetual calendar, while the dial is opaline and the case is crafted from hand-polished 18-carat red gold. 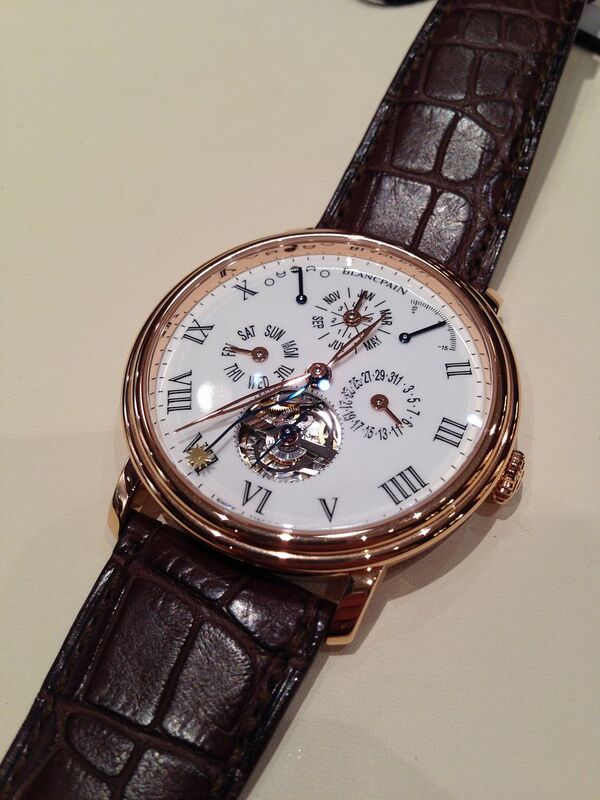 Interestingly, this is also an automatic, which one doesn't see often in this type of watch. 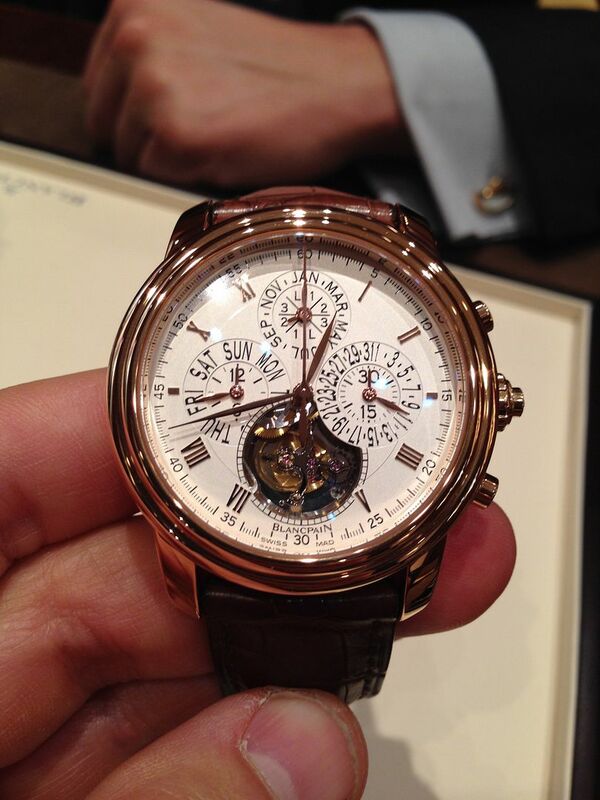 Yes, the hits keep coming folks... Perhaps the penultimate member of the Le Brassus, collection, the Tourbillon Quantieme Perpetuel Chronograhpe Flyaback a Rattrapante (say that five times fast), had my hands shaking. This watch is the real deal Holyfield, and to say that it has presence is to grossly understate just how ridiculously gorgeous it is. The calibre 56F9U movement is also an automatic, and like all Blancpain movements, is hand-finished to within an inch of its life. No, this is not a petite complication in the vein of, say Patek Philippe -- this is an unabashedly stout watch, standing 17mm tall and 42mm wide, which suits me to a tee (ask anyone who knows me -- I'm not a delicate human being). That said, the stepped bezel and opaline dial lend an elegance that belies its size, making this one amazingly well-balance piece, for all that. FWIW, I made it known to Mr. Bossi that both of my children would be at the disposal of the boutique, should he find a way to put this watch in my watch box, but he politely declined the offer. (Read: I already tried it, so don't waste your time. You're welcome). Oh HAI! 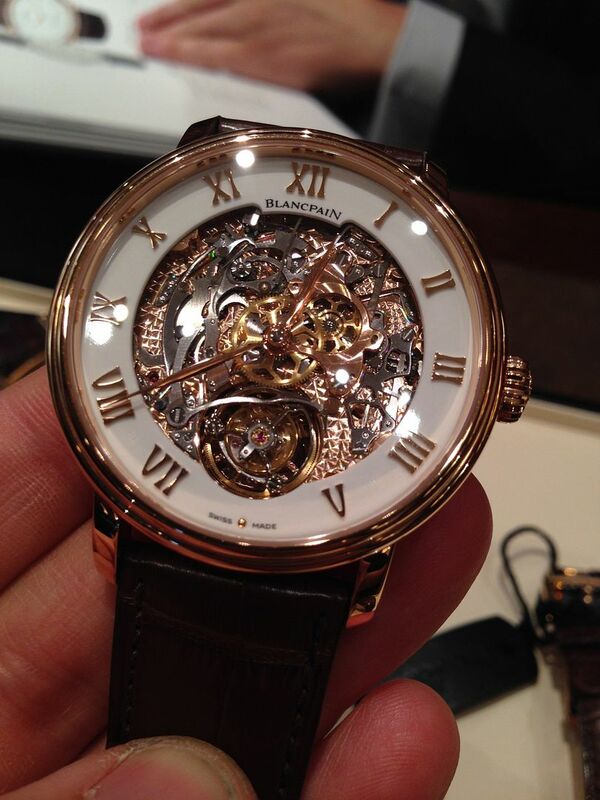 Want a tourbillon? With an 8-day power reserve? 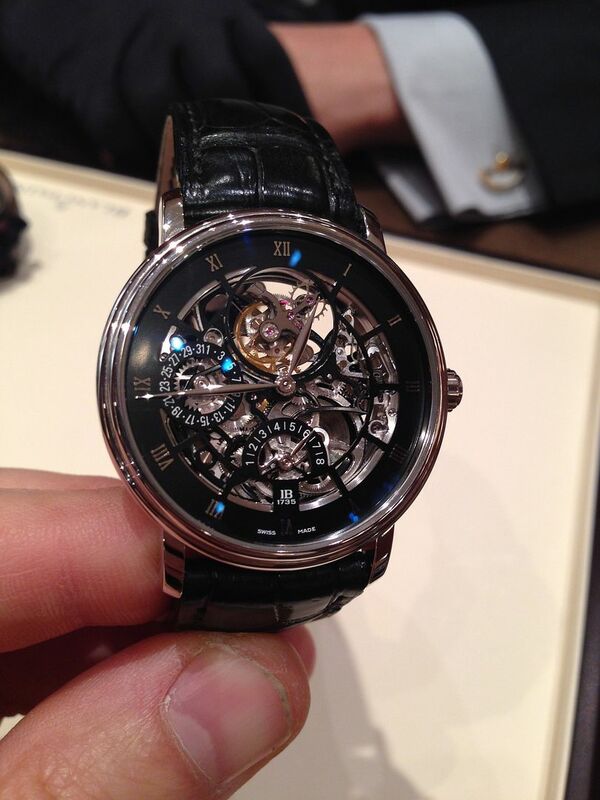 And a skeleton dial? And a PR indicator? 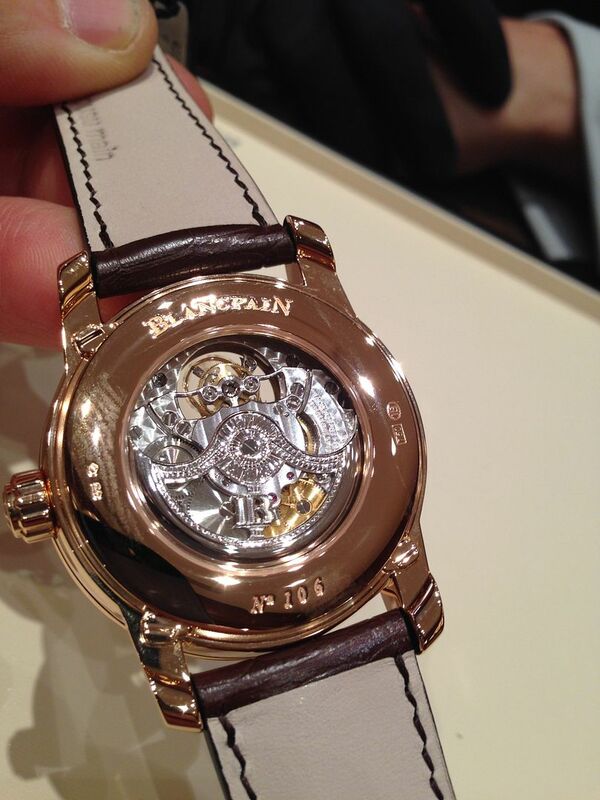 Well, guess what, Blancpain has you covered with the Tourbillon Squelette 8 Jours. Pictured here in platinum, this model is also available in 18-carat red gold. That DIAL! The Stamped flinqué opaline dial of the Quantieme Annuel GMT is the first thing you notice when you set your eyes upon this piece, but what lies beneath is no slouch either. As the name implies, not only is this an annual calendar, but it is also a proper GMT watch, thanks to the inset 24 subdial. Again, Blancpain does without unsightly correctors on the side of the case, so setting the time and the date are accomplished entirely through the crown and the under-lug correctors. Frankly, I'm hard-pressed to imagine a more elegant way of keeping track of the time in two places at once.